National Conference on Wetlands, Climate Change and Biodiversity Conservation – The Society for the Conservation of Philippine Wetlands, Inc. The World Wetlands Day was celebrated this year by holding the National Conference on Wetlands, Climate Change Adaptation and Biodiversity Conservation (NCWCCBC) on 12 to 14 January 2009 at Silliman University in Dumaguete City. This was organized by the Society for the Conservation of Philippine Wetlands with the Protected Areas and Wildlife Bureau of the Department of Environment and Natural Resources and Silliman University. The Conference aimed at setting the stage for the development of a national policy on wetlands, and a national strategy and action plan for the wise use of wetlands and wetlands resources, incorporating concerns on biodiversity conservation and climate change adaptation. The venue – Silliman University was founded as Silliman Institute, an elementary school, on 28 August 1901 by the Board of Foreign Missions of the Presbyterian Church in the USA under the terms of a $10,000 gift from Dr. Horace Brinsmade Silliman, a philanthropist of Cohoes, New York. It won full recognition as a university in 1938. Silliman University is located in the charming city of Dumaguete, dubbed “City of Gentle People,” an hour away by plane from Manila and roughly five hours away by boat from Cebu. 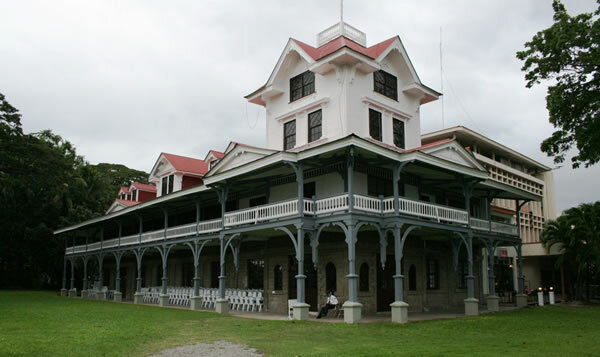 Silliman Hall is the oldest standing American structure in the Philippines representative of “stick style” architecture. It is the oldest building on campus, built in 1903. It stood the test of time with its four-storey structure made of local coral blocks and solid iron posts. The metal sheets used as ceiling were taken from an old theater in New York. Imported timber from the US West Coast made the rest of the upper floors. To initiate the updating of the National Wetlands Action Plan taking into consideration the important role that wetlands play in biodiversity conservation and climate change adaptation/mitigation. To come up with a Conference Resolution on defining the main elements and scope of the National Policy on Wetlands and defining an agreed direction for the way forward among the key stakeholders.